What is the most popular networking site for large corporations? According to a report by NetProspex and summarized by MarketingProfs, LinkedIn is the most popular social networking site among the employees of the nation’s largest corporations. The report also stated the employees of Microsoft are the most actively involved in social networking (next come eBay, Amazon, and Walt Disney). 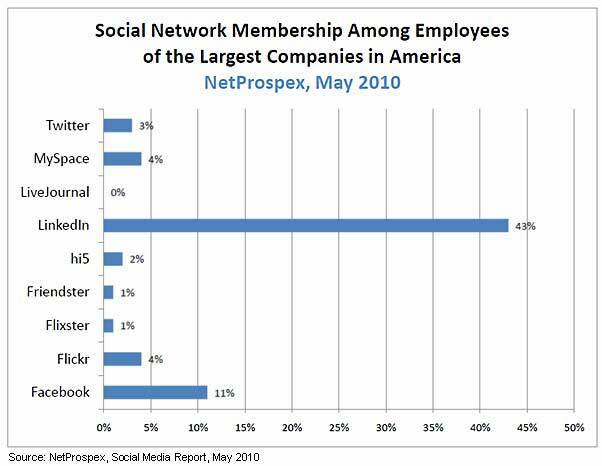 Overall, 43% of employees of large corporations have a membership on LinkedIn. Below are additional findings from the NetProspex Social Media Report, which examines social media activity among employees of the nation’s largest corporations. About the data: The study was conducted jointly with Rapleaf, and results are based on analysis of social media activity of over 100,000 NetProspex database contacts from among the nation’s largest companies. Does your company actively utilize social media? How? Please let us know in the comments below.